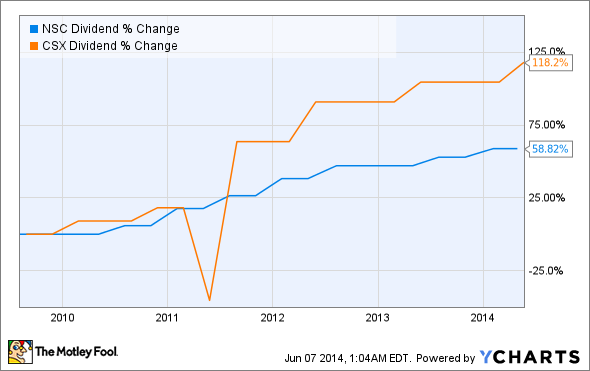 Norfolk Southern Corp. vs. CSX Corporation: Which Stock's Dividend Dominates? 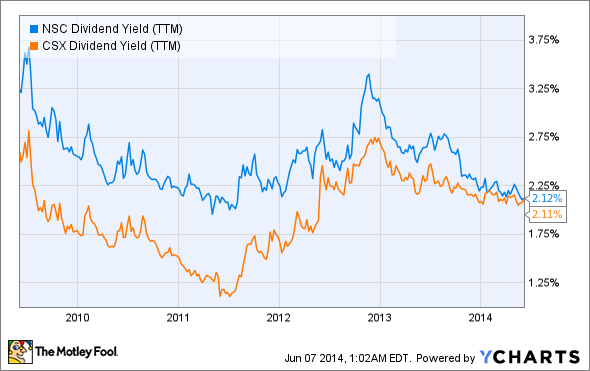 Two railroads square off in a battle of dividend fundamentals. But few of us can invest in every single dividend-paying stock on the market and, even if we could, we're likely to find better gains by being selective. Today, two of America's largest railroad operators will square off in a head-to-head battle to determine which offers a better dividend for your portfolio. Established in 1982 through the merger Norfolk & Western and Southern Railway, Norfolk Southern Corporation (NYSE:NSC) is one of the largest railroad companies in the United States, operating the most extensive intermodal network on the Eastern Seaboard, and transporting a great deal of the United States' coal and industrial goods. Headquartered in Norfolk, Va., Norfolk Southern's network stretches across more than 20,000 route-miles in more than 22 states and the District of Columbia. Norfolk Southern also transports overseas consignments through several Atlantic and Gulf Coast ports. Founded in 1980 by the merger of Chessie System, Seaboard Coast Line, and several other railroads, CSX Corporation (NASDAQ:CSX) is also one of the largest railroads in North America. The company currently offers traditional rail service in 23 states, the District of Columbia, and the two Canadian provinces, with a fleet of more than 4,000 locomotives and operations at 70 coastal ports. Headquartered in Jacksonville, Fla., CSX boasts more than 21,000 route miles in the eastern U.S., and also operates production and distribution facilities in conjunction with 240 regional railroads. It also has access to Pacific ports through its alliances with western railroads. According to Dividata, Norfolk has paid dividends to shareholders for 32 years since it initiated distributions in 1982. However, Norfolk's corporate history boasts more than a century of dividends, as predecessor Norfolk & Western paid uninterrupted dividends beginning in 1901. CSX has a commendable streak of its own, but falls short of Norfolk's streak, as its predecessors only began paying dividends in 1922. Norfolk has boosted its payouts at least once every year since 2001, for a 13-year streak of dividend growth. That gives Norfolk an easy victory over CSX, which has only increased its payouts annually since 2006. A stock's yield can stay high without much effort if its share price doesn't budge, so let's take a look at the growth in payouts during the past five years. Norfolk Southern may have won the best-of-five on the basis of its history, but investors should never base their decisions on past performance alone. Tomorrow might bring a far different business environment, so it's important to also examine each company's potential, whether it happens to be nearly boundless or constrained too tightly for growth. Norfolk is already capitalizing on booming crude oil production in North American shales. U.S. railroads should benefit from stricter trucking regulations. Large railroads are aggressively investing in expanding the current U.S. rail network. Highly congested urban highways present opportunities for railroad operators to pick up new business. CSX plans to convert more than 9 million truckloads in the East to intermodal transport. Nebraska's district court recently blocked the Keystone XL pipeline from progressing. U.S. railroad operators could transport 700,000 barrels of oil per day from Canada this year. CSX has fielded growing demand for coal as natural gas price rise. Norfolk is highly exposed to declining coal consumption at U.S. power plants. Norfolk lowered full-year expectations due to poor weather in the first quarter. Railroad operators face congestion problems and delivery delays as shipping demands outpace available transportation supplies. Domestic active coal project earnings have declined significantly, putting pressure on coal-transporting rail operators. A CSX oil-carrying train derailed and caught fire in Virginia, which could result in tougher rail regulation. In this writer's humble opinion, it seems that, while these two rail operators are extremely similar, Norfolk Southern has a better shot at long-term outperformance, which stems as much from its superior financial history as from its energy-focused future. However, these railroad operators are both exposed to declining coal shipments, but could also both benefit from a shift in traffic away from increasingly congested North American urban highways, and tighter trucking regulations also offer opportunities for growth for both companies. With so many similarities between Norfolk Southern and CSX, it seems safer to invest in the railroad that's shown itself to be a better friend to shareholders over the long run. You might disagree and, if so, you're encouraged to share your viewpoint in the comments section below. 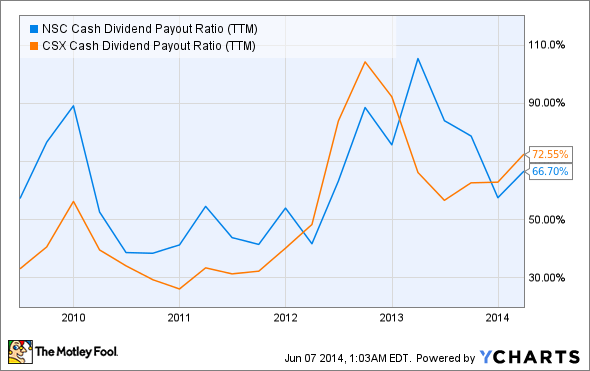 No dividend is completely perfect, but some are bound to produce better results than others. Keep your eyes open -- you never know where you might find the next great dividend stock!